ABAC Host "Story, Transformation, and Why Writing Matters"
Tifton, GA – Abraham Baldwin Agricultural College (ABAC) and its Literary Magazine The Pegasus will be hosting writer, naturalist, and activist Janisse Ray for a lecture called “Story, Transformation, and Why Writing Matters" on April 20 in Horticulture Building room 131. Ray lives in Tattnall County in Southeastern Georgia with her husband and daughter on an organic farm. Ray has won the 2017 Southern Environmental Law Center Award in journalism, and was inducted into the Georgia Writers Hall of Fame in 2015. Her most notable and most recent book was The Seed Underground: A Growing Revolution to Save Food where she won the Arlen Eisenberg Award, American Horticultural Society Book Award, Nautilus Gold Book Award, Garden Writers Association Gold Award, and Green Prize for Sustainable Literature Award. Ray lectures nationally on nature, community and the politics of wholeness. If you would like more information about this topic, please contact Dr. Rachel Price at 229-391-4973 or email at rprice@abac.edu. 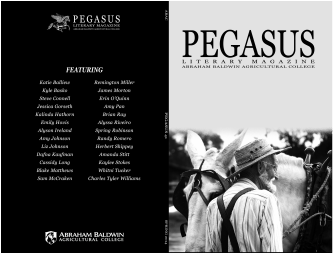 Pegasus, Abraham Baldwin Agricultural College's award-winning literary magazine, is now in its fort-first year of publication. It has placed twice in regional competition: at the Agricultural Communicators of Tomorrow in Alabama (1977) and at the Savannah Regional Press Institute (1984). From 1988 to 1998 Pegasus won numerous American Scholastic Press Association awards, including first place and first place with special merit. Featuring works by Georgia high school, college, and university students; ABAC staff, faculty, and alumni; and selected outside contributors, Pegasus is a regionally-renowned magazine dedicated to publishing art/photography, creative nonfiction, fiction, and poetry. This student-run publication provides a wonderful opportunity for writers and artists to display their work to an appreciative audience. Pegasus is both an organization and a one-semester hour course; students do not need to be enrolled in the course to be a part of the staff. Staff members learn about literary magazine publishing, recognizing literary merit, and layout and design. The Pegasus office is located on the third floor of Branch Hall on ABAC's campus. Pegasus sponsors many events throughout the academic year, including the Banned Book Read-Out (co-sponsored with The Baldwin Library), Writers' Harvest, and a monthly open mic night at various places around the Tifton community. For information about future Pegasus events, please see the Pegasus Facebook page or follow Pegasus on Twitter. Interested parties should contact Pegasus faculty advisors Rachel Price (229-391-4973) or Brandi Arrington (229-391-4966). Look for Pegasus on Facebook and Twitter.